Plumbers work in both commercial and residential settings to repair, install, and maintain plumbing fixtures and systems for drainage, heating, drinking, venting, and sewage. A large part of the job involves the ability to work with building blueprints to assess layouts of plumbing systems and the water supply. "Wet only plumbers" handle piping systems in bathrooms and radiators. "Gas only plumbers" focus on industrial work. While plumbers are responsible for a wide range of tasks, there are basic skills that apply to all jobs. Here are some to highlight on your resume. Highly skilled Plumber with 6 years’ experience in both industrial and commercial plumbing. Demonstrated track record troubleshooting complex plumbing systems, estimating and controlling project costs, and ensuring compliance with all trade practices and plumbing codes. Assemble, install and repair pipes, fittings and fixtures of heating, water and drainage systems. Install and repair plumbing fixtures such as sinks, bathtubs, water heaters, hot water tanks, garbage disposal units, and dishwashers. Worked effectively with the construction department to plan plumbing necessities for new buildings, including studying blueprints and developing logical plans for installation. Assisted with training of plumber apprentices. Repaired basic home plumbing issues such as clogs and leaks. Assisted plumber with piping, sewage, and installation of new home appliances. According to the Bureau of Labor Statistics’ Occupational Outlook Handbook, career prospects are bright for plumbers, pipefitters, and steamfitters. The 2017 median pay for individuals in these roles was $52,590 per year ($25.28 per hour), and the number of available jobs is expected to increase by 16% by 2026. To maximize your chances for employment, it’s a good idea to earn both core and advanced certifications. 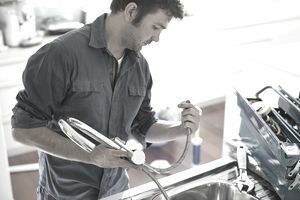 The most common national certifications include NCCER Certification (National Center for Construction Education and Research), Journey Level Pipefitter-Steamfitter and UPC Journeyman Plumber (National Inspection, Testing and Certification Corporation), Certification in Plumbing Design (American Society of Plumbing Engineers), Plumbing Plans Examiner (International Code Council), Fluid Power Connector and Conductor (International Fluid Power Society), and STAR Plumber Mastery and STAR Steamfitting-Pipefitting Mastery (National Inspection, Testing and Certification Corporation). Experienced plumbers can also earn the following certifications to become inspectors: Commercial Plumbing Inspector, Plumbing Plans Examiner, Residential Combination Inspector, and Residential Plumbing Inspector (International Association of Plumbing and Mechanical Officials).